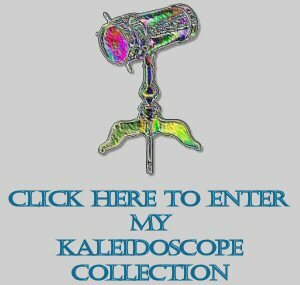 Kaleidoscopes for sale: From time to time, scopes from my own collection and those from fellow scope collectors may become available for sale. KALEIDOTRAK organizes your kaleidoscope collection into one centralized location. It is an easy-to-use database of all your kaleidoscope information, and you may attach photos of each scope to the information about that scope. Your heirs will thank you, your insurance agent will thank you, and you’ll be glad you took the time to put the details of your collection in a single, easily accessible format for valuation purposes. Kevin Kohler, author of KALEIDOTRAK, is a long-time collector, so the program is quite comprehensive. KALEIDOTRAK V2.1 can import kaleidoscope information records and images from the Mirrors and Light Gallery. KALEIDOTRAK V2.1 is now available for $44.95, including shipping & handling. A free demonstration version of Kaleidotrak is available for download. For more information and to buy, visit the KALEIDOTRAK home page. The Kaleidoscope Collector's Guide, published by Mirrors and Light Gallery is a must for every kaleidoscope collector. The amount of work that went into producing this volume is amazing. Over 2,000 kaleidoscopes and descriptions listed on 200+ pages. Hundreds of photos in black and white, with color sections of limited editions and one-of-a-kind pieces, and beautiful image photos. Tips on buying scopes in the secondary market, valuation criteria for kaleidoscopes, price estimates and most recent pricing for many kaleidoscopes sold in the last year or two. A product of Google Book Search, here's a digitized version of Sir David Brewster's The Kaleidoscope - Its History, Theory, and Constructioni (J. Murray, pub. 1858). Click on the icon to view the .pdf (5.7Mb). Comments and suggestions can also be sent to "Webmaster" <webmaster_1 at kaleidoscopecollector dot com>. Site hosted by 1 and 1.